Signals from external actors are important because they represent a potential increase (or decrease) in fighting capabilities for the government or the opposition if a war were to begin. Costly signals should not affect the probability of civil war onset because they are readily observable ex ante, which allows the government and opposition to peacefully adjust their bargaining positions based on changes in relative capabilities. In contrast, cheap hostile signals make civil war more likely by increasing the risk that an opposition group overestimates its ability to stage a successful rebellion with external support. Cheap supportive signals work in the opposite manner because they represent increased fighting capabilities for the government. 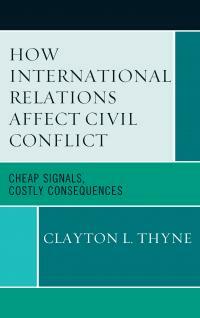 Furthermore, signals sent in the pre-war period have important implications for the duration and outcome of civil conflicts because competing intrastate actors develop expectations for future interventions prior to deciding to fight.